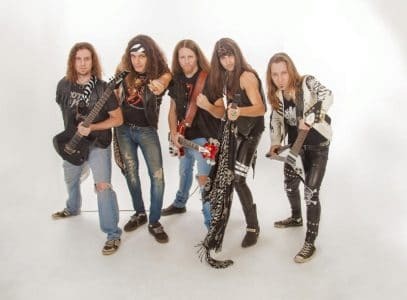 CANADIAN GLAM ROCKERS, RUSTED, ARE SET ON DOING THINGS THEIR WAY WITH THE HOPE OF EMULATING SOME OF THE GREATS BY HAVING RELEASED THEIR FIRST LIVE ALBUM ‘LIVE, WILD & FREE’ DESPITE ONLY HAVING ONE EP (‘HIT BY’) AND ONE FULL-LENGTH ALBUM (‘ROCK PATROL’) UNDER THEIR BELT. ‘LIVE, WILD & FREE’ CAPTURES RUSTED LIKE YOU’VE NEVER HEARD THEM BEFORE IF YOU HAVE NEVER SEEN THEM LIVE AS THE BAND MEMBERS EXUDE TON OF ENERGY ON STAGE, WHICH IS CAPTURED ON THEIR LIVE ALBUM. 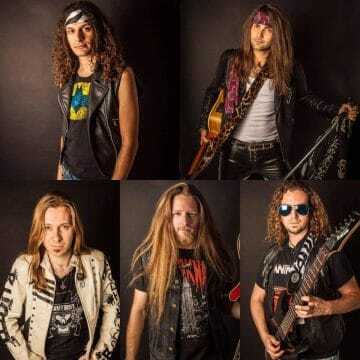 SLEAZE ROXX CAUGHT UP WITH RUSTED’S GUITARIST BRUNO (ALSO KNOWN AS MANIAK) TO CHAT ABOUT THE LIVE ALBUM, WHEN WE CAN EXPECT A NEW STUDIO ALBUM AND A FUNNY STORY FROM THE GROUP’S FIRST TOUR IN EUROPE BACK IN 2015. Sleaze Roxx: Congratulations on Rusted’s first live album ‘Live, Wild & Free.’ I understand that it has been a long time in the making. How come it took so long between the release of the live album and the pledge campaign, which was more than two years ago? ManiaK: It’s a bunch of things put together. One of the first one is the sound engineer, Marc-Andre Boily, which we worked with to record our live performances and than mixing the album, is a very busy guy. He’s working for Cirque Du Soleil and he’s always like all around the world, working in China, in California, all over the world. It was hard to catch up with him and sometimes our schedules would not fit with him. He would come back from his gig away in the world and we would not be available to work with him. So this plus being busy with other stuff — we had some tours in between. We had other things plus we were trying to put things together with our personal lives and music. So all of the things combined ended up being two years in the process. So it took a long time but also one thing since the crowd funding campaign, we were planning to use a few recordings from the tour we had with Blaze Bayley in Canada. We had one friend with us on the road. One of our roadies also had a recording system with some of it really good. But at the end, we listened to everything and we weren’t quite happy with the results plus some stuff happening that was unlucky. One of the best shows that we recorded, half of the recording was missing for some technical reason. ManiaK: So anyways, for a lot of reasons, we decided to do another recording and that’s when we called Marc-Andre Boily who is more of a professional sound engineer. We called him and we recorded another show so that was already pushing the project further in time. So he recorded his show at Cafe Campus in Montreal [Canada]. That’s also one of the reasons that it took so long because we were finally working with a brand new recording. Sleaze Roxx: Now, as a relatively new band, it’s somewhat unusual to release a live album so early in your career/ Why did you decide to do that? ManiaK: Of course, there is this ’80s kind of classic rock thing — we are really attached to this vintage thing. We are really into all the ’80s hard rock and heavy metal bands releasing live albums. There was of course this part — kind of the pride of this vintage thing. But mainly, stepping back a few years after ‘Rock Patrol‘, we realized that we were missing something in this release, which is the live energy of Rusted and which is something really important for us and also for a lot of people. We had a lot of feedback from people saying, “Ah. 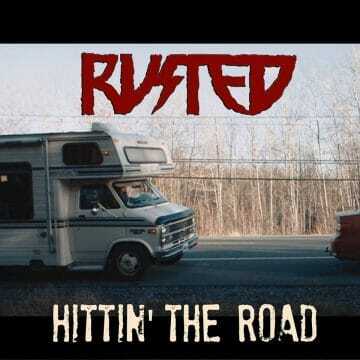 I love Rusted live. I don’t listen to it but I love them live.” We had this feedback a lot and that’s when we realized you know that we didn’t have this on the album. ‘Rock Patrol’ — we really like it. It’s top notch professionally produced but maybe it was too clean or something which was not Rusted. You know, Rusted live, it’s kind of dirty and it’s not perfect. You know what I mean? This rock and roll thing, it’s moving. The tempo’s not perfect. But there’s this energy that we all have together and people love Rusted live for this energy. So really, the objective for this album was to witness and to immortalize this energy of those songs and give them new life and maybe do them justice in this way. Sleaze Roxx: Having seen you guys play live, I agree that there’s something missing between the ‘Rock Patrol’ album and Rusted live. Why did you decide to put so many songs on the live album? ManiaK: Well, it was the opportunity because we played this show that was recorded for the live album. We put together this big setlist — kind of a best of ‘Rock Patrol’ and our first EP ‘Hit By.’ We were happy also to give new life to those old songs from the first EP, which is really different. Even Tony’s [Rust] voice is really different now. We have some arrangements that were not on the EP. It was also an opportunity to give new life to those songs. We still skipped some songs. There were more songs at the beginning but we did not keep everything but we tried to do a best of for the first Rusted years through this live album. 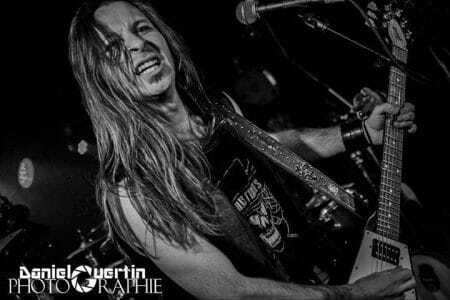 Sleaze Roxx: You also have a brand new track “Hittin’ The Road” on the album. Why did you decide to include that track? ManiaK: We were thinking, we were talking about “Should we wait for our second album to put ‘Hittin’ The Road’?” But then, we realized that it might take a while for the release and the recording of the next album. You know, the video clip was already out and a lot of people liked or loved that song. That song has more of a heavy metal vibe maybe. So I also think that it was good timing to put a bonus track and put “Hittin’ The Road” on a release. Directed by Jérémie Monderie Larouche and Productions Balbuzard Filmed in Rouyn-Noranda, QC, Canada Huge thanks to Michael Dupuis-Souligny for the RV. Sleaze Roxx: You released the video back in August of this year. Why the delay in the release of the video compared to the released of the live album? ManiaK: The “Hittin’ The Road” single was more a bonus that we added after. At the time, we are still in the mixing process, which was actually a more complicatied process than we thought. That’s also why it took so long. Mixing the live tracks with all the noise around the microphone, it’s really something very difficult. It was more work that we imagined. That’s also one of the reasons why it took so long. 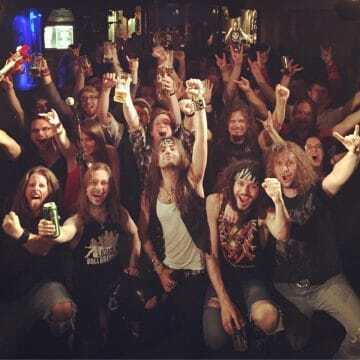 Sleaze Roxx: I thought that the live album turned out really well and you can really feel the energy. For your next studio album, will you try to have more of a live feel to it? ManiaK: We definitely will try to have something more — you know, maybe not record everything live but some part live. ‘Hit By’, our first EP — now, it’s five or six years old — but we still kind of had a nice energy because the recording was live. I know because we got really good reviews because of this. We’re definitely going to search for something more live and to keep this energy — maybe something more rock n’ roll. Maybe something not as perfect but definitely closer to the live performance. 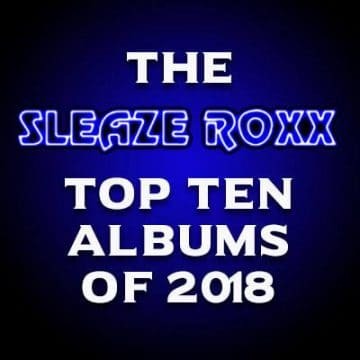 Sleaze Roxx: And what is the status of the new studio album? Where are you guys at? ManiaK: We have a new song that we play live currently and we also have a bunch of demos. I know that [Rusted singer] Tony [Rust] has a lot of lyrics but I also spend a lot of time jamming with Dizzy the drummer because we live together and close to the jam space. So I have six or seven tracks recorded with him — just me and him — guitar/drums. We also have a lot of demos that we are still working on and we just need to sit together and take the time. I think in the next month, with the release of the live album, our attention was kept by the live album. We kind of put on hold the writing process to focus really on this release. I think that we had this feeling that we need to release the live album so that we could switch to another chapter. I think that was the feeling for everybody. Now, it’s the end of the ‘Rock Patrol’ chapter in Rusted’s history and now we can look for the future and dive more in the writing process. We have a lot of — I know that [Rusted guitarist] Tom[my D. Eagle] also has riffs here and there that they were already jamming. So we just need to sit down together and get more in the writing process. I feel that we have a lot of material. ManiaK: I think this is still foggy if I can say. We don’t know yet when we are going to have the time. We have other projects around… Hopefully, we will be done like around the summer for the writing process to go into the studio. That will be one of our objectives. Last time, we were talking about the next album. We will definitely be finished — like the writing process will be finished next year for sure. We would love to release it next year but you know, the time to find a studio and also the money and everything, and maybe a record label for this next one. I think that it does take time so I want to be optimistic and say “end of 2017” but maybe it will go to the year after. But definitely, we’ll be finished writing next year. 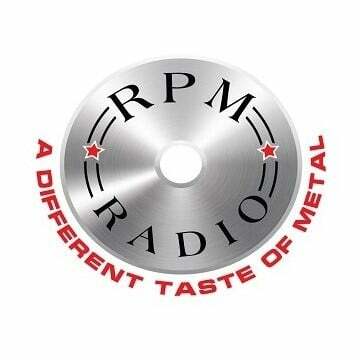 Sleaze Roxx: In terms of Rusted’s plans, you have the new live album. You’re working on a new studio album. What else do you have planned for 2017? ManiaK: There is something coming out in January but I cannot tell anything yet. There will be something happening in January this month. We would like of course to go back on tour, and especially in Europe since we had a really good response out there and there are so many places that we didn’t go to. For example, the UK — we were supposed to play London on the last tour but the van broke down in Amsterdam so we were not able to go to London. So maybe we are thinking of going for an UK tour but also, these are just projects that we have and we talk about but there is nothing concrete at all. So we’ll see how it goes. I think we need to sit this month and talk more about the directions because we need time to really get into the writing process. We postponed this because we were playing a lot last year or the year before. So maybe play a bit less to write more music but of course there are going to be live shows. We just released the live album so hopefully, we are going to play a bunch of shows in Canada for sure. And also maybe a tour in the summer with somebody who we have already played with but nothing is confirmed so I cannot say anything yet [laughs]. Sleaze Roxx: [Laughs] Alright, fair enough. I just want to get your perspective on this since you are from France. 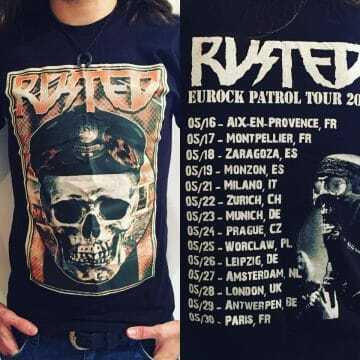 When I spoke to [Rusted singer] Tony [Rust] last year about the Europe tour, he indicated how amazing it was and what a great atmosphere it was. There has always been this talk about the crowds are so different from Europe to North America. What is your take on that? ManiaK: Hmmm. I think it depends really on the countries. Generally, what we saw is that there are more people maybe thirsty for this kind of music. There is more of a scene in our genre of music. I think that people are more into the hard rock stuff, the ’80s old school stuff, but in my opinion, for example in France, it just has to do with statistics because there’s more people there, right? 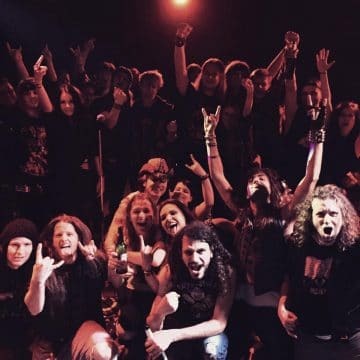 For example, in [the province of] Quebec [in the country of Canada], there are seven million people and in France, there are 70 million people so just in terms of statistics and population, there’s more metal heads there and more people into our scene. ManiaK: Sometimes, we feel that what I would call our scene. For example, we’re not in the speed heavy metal scene, like the New Wave of British Heavy Metal scene. We’re a bit on the side of this since we got this glam rock n’ roll thing. And we’re not in any kind of niche or you know what I mean, any kind of music genre that does not have a big scene but a lot of people following this. So I think that we have more chances in Europe to find more people interested in our scene. Just to mention, for example in Germany, we just played two gigs in Germany but there were a lot of people into that scene. For example, we played this show in Leipzig in east Germany and it was a Tuesday night. It felt like the ’80s. It was this small venue but it was packed with people 17 [years of age] to maybe 28, not even 30, and they were all wearing bandanas, Skid Row shirts, old school Mötley Crüe shirts… It was like the perfect crowd you know? We had never seen a crowd like this. It was really true hard rock vintage guys. It was amazing. 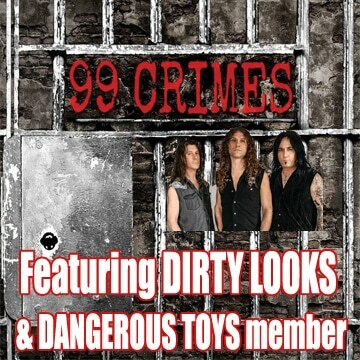 Sleaze Roxx: Can you give me one funny story that happened to you guys on the road? ManiaK: Oh my God! There are so many! Hmmm. What can I think of other than the van breaking down in Amsterdam and being stuck there? For example, when we played in Prague in Czech Republic, the day before, we were playing in Munich, Germany I think. I was kind of the only one driving because of the manual [vehicle] thing, and I kind of partied all night but finally when the day comes up, I decided “Oh. It’s not a long ride to go to Prague.” So I drove all the way. We arrived in Prague and we were downtown. After we unload the van, the promoter is like, “Okay. You can try to find a parking [spot] there or there.” But it was going to be difficult because it’s a van with a trailer. And so I went with one of our roadies and we tried to look for parking. We were like, “Okay. We’ll be back.” And the guys were like “Yeah but don’t be late. The food is ready and everything.” It took us two hours and a half to find a parking spot. It was a nightmare and finally, we found a spot behind a restaurant on the other side of the river. I ran into the restaurant and told them, “We’re playing a show there. We’ll be getting the van in two to three hours. Can we leave the van here?” They were like, “Of course, no problem.” Then we run back. We kind of get lost in the small streets of Prague and finally we get there and they had to change the band schedule. We had no phones to text each other. Sleaze Roxx: Oh no [laughs]! ManiaK: So finally we show up. “Where were you guys? Oh my God!” I was so tired because you know, I did not sleep from the night before to the whole day and then looking for parking. I just ate what was there. I am a vegetarian and there was meat loaf. ManiaK: I was so hungry so I was like “OK. I need to eat something. Just take a bite of this.” It was amazing. We got on stage and the venue was packed. I think Tony’s microphone was not working. It was that kind of evening but it was still cool because there were a lot of people. Then, me and Daniel Dizzy, the drummer, we go get the van. We arrived there and the doors of the park are closed. ManiaK: Finally we went back but yeah, Prague was a nightmare. 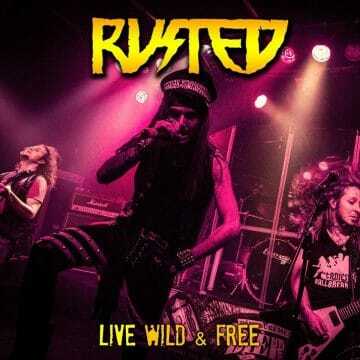 Rusted’s new live album ‘Live, Wild & Free’ can be purchased at the group’s Bandcamp page.